Computation of stereoscopic depth and disparity map extraction are dynamic research topics. 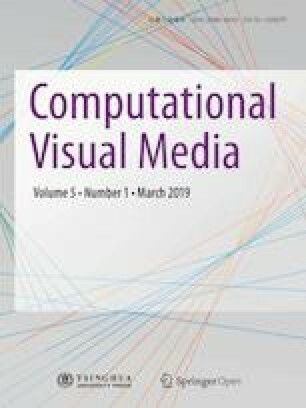 A large variety of algorithms has been developed, among which we cite feature matching, moment extraction, and image representation using descriptors to determine a disparity map. This paper proposes a new method for stereo matching based on Fourier descriptors. The robustness of these descriptors under photometric and geometric transformations provides a better representation of a template or a local region in the image. In our work, we specifically use generalized Fourier descriptors to compute a robust cost function. Then, a box filter is applied for cost aggregation to enforce a smoothness constraint between neighboring pixels. Optimization and disparity calculation are done using dynamic programming, with a cost based on similarity between generalized Fourier descriptors using Euclidean distance. This local cost function is used to optimize correspondences. Our stereo matching algorithm is evaluated using the Middlebury stereo benchmark; our approach has been implemented on parallel high-performance graphics hardware using CUDA to accelerate our algorithm, giving a real-time implementation. Mohamed Hallek was born in 1988. He is a Ph.D. student and member of the Laboratory of Electronics and Microelectronics at the Faculty of Sciences Monastir, Tunisia. He obtained his master degree in micro- and nanoelectronics in 2012. His fields of interest are pattern recognition and stereo matching algorithms. Fethi Smach was born in Tunisia in 1976. He received his master degree in computer science from the University of Sfax, Tunisia, in 2003. He is currently finishing his Ph.D. thesis at the University of Burgundy. His fields of interest are algorithms for pattern recognition, classification algorithms, and their real-time implementations. Mohamed Atri was born in 1971. He received his Ph.D. degree in microelectronics from the Science Faculty of Monastir, Tunisia, in 2001. He is currently a member of the Laboratory of Electronics and Micro-electronics and professor in the Faculty of Sciences Monastir, Tunisia. His research includes circuit and system design, image processing, network communication, IPs, and SoCs.